You are here: Home / General Information / Animals Today Jan 19, 2019: Hot Animal News! Pigs as companion animals. Penguin update. A new vegan mentoring program. We begin news of a new law in California, where pet stores will only be permitted to sell dogs, cats and rabbits from rescue groups or shelters, and not from breeding facilities. Also, an Iowa ag-gag law was just struck down as a violation of 1st amendment protections, and the demand for vegan food continues to grow as fast food restaurants including KFC, McDonalds. Carl’s Jr. and Subway are beginning to offer plant-based menu items. Lori continues with veterinarian Evelyn Mackay from at Texas A&M College of Veterinary Medicine, who tells us about the ins and outs of pigs as pets. Pigs are smart, inquisitive, and loyal, they enjoy belly rubs, and some even like to take walks. But, even the smallest pet pigs are going to weigh 60 to 80 lbs., so be diligent in your research! 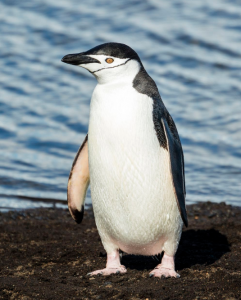 Peter then welcomes back to the show penguin authority Dyan deNapoli who tells us about a huge colony of newly discovered penguins, suggests some good ways to view penguins up close, and reports on the severe penguin conservation crisis. The top two threats to them now are overfishing and climate change. We conclude with Elana Kirshenbaum, New Leaf Program Manager at Catskill Animal Sanctuary. New Leaf is a vegan mentor program that helps people become vegan with the guidance of a trained mentor.